The ocean is a far thirteen miles from West Adams. 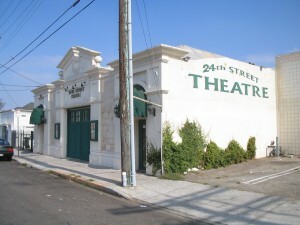 Far from 24th street near Hoover where at a building that once housed horses is now the home of the 24th Street Theatre. Where within that theatre the opening night and West Coast premiere of Mike Kenny’s Walking the Tightrope is set to begin. “It’s not your typical smallhouse,” says Mark Bramhall, ‘Granddad’ in Walking the Tightrope. “The paint is the same,” says Artistic Director Debbie Devine, with a smile. The crowds laughs. But there is more truth than just the obvious. One of the things that define productions at the 24th Street Theatre is its mission to relate to both the younger and adult members of the audience. “When we first came to this neighborhood, some of the kids had never seen a play,” says Devine. And so, along with a reputation for ‘edgy’ and ‘progressive’ productions, LAB24,the resident theatre company, assumed the responsibility of some type of moral and civic duty in presenting the dramatic arts to our youngest generation. McAdams then announced the show to begin shortly and made his way off the stage. My eyes wandered back to the mother and son who had by then found some seats. And not very good ones. At best the child would only get a limited view. Once more, I felt the impulse to walk over and offer my seats. The thought lingered and I could hear the young boy asking his mother questions indifferent of his view. He was happy just to be in attendance. Walking the Tightrope is story about a young girl, Esme, who annually visits her grandparents, Granddad and Nanna. This year, however, there is no Nanna and it is left to Granddad to explain why. To help him, there is a sort of guardian angel character portrayed by a circus clown (Tony Duran) that neither character can see. And so, with a truly innovative production and wonderful performance ahead, roughly an hour in length, it is for the audience to learn what it means to both walk the tightrope, and walk the tightrope of a LAB24 performance. And for the moment I didn’t have to worry about the empty seat anymore. Following the show, like most of the audience, I was still very much engaged with the story. I enjoyed Mark Bramhall’s performance. It was brilliant and believable. And for an actor who has been both on stage and behind the camera since the late ‘60s his insight is delightfully optimistic. White’s performance was just as good and, in some odd way, as believable as an immature young girl as mature one. Her curiosity is crucial to the outcome and her believability is what holds the play together and makes it all work. By the end of the performance we can clearly see her growth. The difficult moments that we face in life do not cease in the presence of children. More than often those are the moments that hasten the maturity of a child. Devine, McAdams and LAB24 seem to have tapped into a way of storytelling that addresses those issues on planes that would be seemingly conflicted. That is to say, the task of telling a story to a pre-adolescent, the ability to keep their attention for 70 minutes, inherently requires a different mode of storytelling than an adult. In the movies that may be Pixar or Disney. On television, it may be cartoons or reality shows. 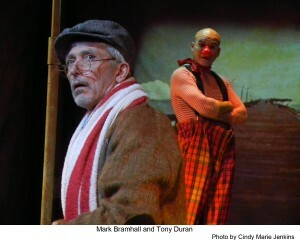 But in the theatre, there are still clowns, both happy and sad. 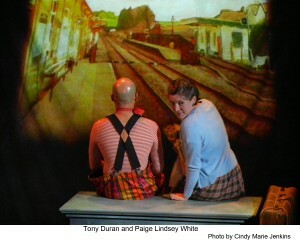 Clowns with big red noses and bald heads who walk high above us (don’t forget to look up when they point!) and smile down at us from the heavens that they roam. For those in the audience who are in single digit age groups, the moment for them is watching a trio of very talented actors taking them out of their world and delivering them into another, i.e., introducing them to the very powerful presence of the theatre, and all the inexplicable delight one can have watching them perform. During the reception I once again happened on to the young boy, juice box in hand, and his mother. I heard her ask the words that I too was curious to know. The boy smiled and, of course, I could not hear his response.